Posted on Fri, Mar 16, 2012 : 5 a.m.
Charlotte Perkins Gilman, a sociologist, novelist and lecturer for social reform who died in 1935, said, "Audiences are always better pleased with a smart retort, some joke or epigram, than with any amount of reasoning." I hope my audiences are happy with both, because to play bridge well, one must use reasoning. This deal is similar to yesterday's, but with a key difference: The diamond ace has migrated from East to West. How does this card movement affect the hunt for the spade queen, if at all? South is still in four hearts. West again cashes two clubs, then shifts to a trump. Yesterday, I mentioned that when advancing partner's takeout double, not only do you show which suit you prefer, but you also give an indication of your hand's high-card count. Sometimes, though, you bid in no-trump. An advance of one no-trump shows 6 to 9 points, two no-trump indicates 10 to 12, and three no-trump promises 13 to 15. Remember that you should have strength in the opener's suit because your partner has announced shortness there. And you probably should not have four cards in an unbid major. South loses two club tricks, draws trumps, and (assuming he is not clairvoyant) plays a diamond to dummy's queen and a diamond back to his jack. West takes the trick and leads the club queen. After ruffing on the board and cashing the diamond king to get the bad news, which way should South finesse in spades? 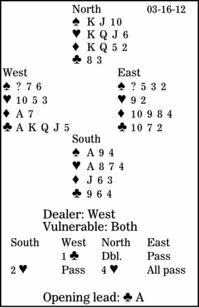 West has shown up with 13 or 14 high-card points and a balanced hand. If he had the spade queen, he would have opened one no-trump. East must have that card.